The Brunson 190 Optical Micrometer is the most popular optical micrometer made, and is still manufactured by the Brunson Instrument Company in Kansas City. 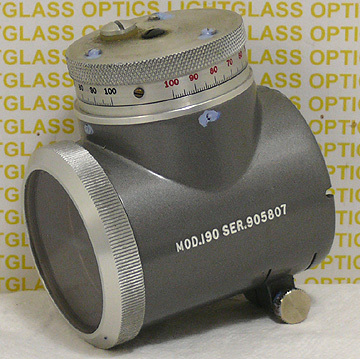 This optical micrometer is used on Brunson's Jig Transits, their 545 Sight Level, and also used with an adapter on Wild and Leica theodolites. The 190 Optical Micrometer uses a precision optical flat whose angle is controlled with the large micrometer knob. Range is +/- .100 inch with an accuracy of .0005 inch.